Each time you make a reservation through this website, your reservation is made directly with Lilas Luxury Villa. As such, you are guaranteed the lowest possible rate, unlike reservations made through third party systems (whose prices include the given platform’s commission). To send a reservation enquiry directly to Lilas Luxury Villa click here! On the ridge of the hill of Bochali, in lush-green Akrotiri, Lilas Luxury Villa looks upon the blue of the Ionian Sea. It is a stone manor, built with taste and rare comfort for those who wish to have peaceful holidays, while at the same time being just a breath away from the cosmopolitan places of Zakynthos. It is only 500m from the sea, 2½km from the town of Zakynthos and the port, and 7¼km from Zante International Airport. One of the best beaches of the island with an enormous sandy beach, Tsilivi is only 4½km away. The home of the national poet of Greece, Dionysios Solomos is at a distance of 400m. The villa provides privacy and quiet, since it is located at the end of a cul de sac, surrounded by greenery. It offers a private pool with hydro-massage, a large veranda, garden, five bedrooms, a very comfortable sitting room with office, free Internet, three bathrooms and two WC. 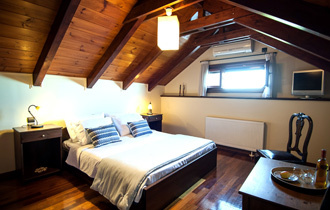 It also has a spacious loft which has been converted into a private office which also has a sofa-bed.